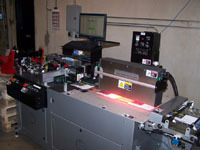 Using three direct addressing, high speed inkjet machines, DMR is able to process over 50,000 pieces per hour. We use three different types of machines so that we can spray on virtually any type of mail piece. Different materials require different technologies to image at the highest quality, and DMR has incorporated both alcohol based and water based ink systems to ensure clear, crisp addresses each time we run a job.